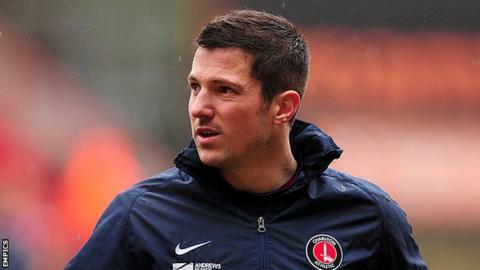 Charlton manager Chris Powell has played down Yann Kermorgant's return to Leicester City with the Addicks. The 31-year-old striker's spell with the Foxes is remembered for his missed penalty in the 2010 Championship play-off semi-final defeat by Cardiff. Powell told BBC Radio Kent: "Leicester fans are very good fans and they were hurt by the play-offs that year, as we all were - players and staff alike. "Personally I think everyone should move on from it, Yann has." The Frenchman joined Leicester in the summer of 2009 and went on to score once in 25 appearances for the club. However, his chipped penalty effort in the play-off semi-final shoot-out against Cardiff, which was saved by Bluebirds goalkeeper David Marshall, proved to be his last kick in a Leicester shirt. He went on loan to Arles-Avignon the following season and then joined Charlton on a free transfer in summer 2011. Kermorgant has already faced Leicester once since his penalty miss, scoring in Charlton's 2-1 victory over the Foxes in August, but Tuesday's match marks his return to the King Power Stadium. "I know it's an interesting story but Yann obviously played in our first home game this year and scored," Powell continued. "I suppose he has to get this out the way because then I think it will die down. "A lot of football has been played since then and I have brought Yann down to London and he has become a bit of a cult hero with our fans. "He has had the experience at Leicester, whether it was good or bad, and you learn from it and move on as a footballer and a man. Yann's done that. "If selected I'm sure he'll be doing his best to score but it won't be about him or even myself." Powell ended his career with Leicester and was a member of their coaching staff until his appointment as Charlton manager in January 2011. "I had a wonderful time there," he said. "It's a superb football club. It will be great to go back."